My career can be chopped up a number of different ways. There's the PA/AP/AD years, and the producer years. There's the single years and the family years. And there's the Big East years and the Big 12 years. For the last decade, there is no team that I've covered more than Kansas basketball. And this week while I was toiling away at home and at Auburn, I saw the two greatest college basketball dunks I can remember. They were both by Jayhawks in the ever-heightening game of "can you top this?" between Jeff Withey and Ben McLemore this season. Both got me jumping out of my chair and shouting when there was nobody else around. 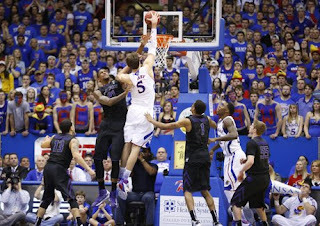 The first was Monday night by Withey, posterizing Kansas State's Jordan Henriquez. The sheer power of the slam with a strong defender draped all over him was awesome. The fact that the slam was (way) contested and Withey brought it home with the "and one" made it one of the most remarkable basketball plays of this or any other season. And Withey was properly pumped up about it without going over the top. Then on Saturday night, with the game against Texas well in hand, Ben McLemore got out in front of the field and did the most perfect, business-like 360 you will ever see outside of a dunk contest. When he was out ahead you could feel it coming, but you had no idea what was about to happen. The stills obviously don't do these athletic feats justice. 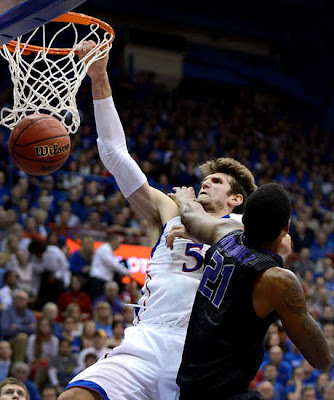 So here are the You Tube links for the Withey dunk and the McLemore dunk. You're welcome.